In August 2016, the Norfolk Archive and Heritage Development Foundation (NORAH) and the Norfolk Record Office (NRO) learnt of a forthcoming and significant sale of Norfolk archives. A local collector had decided to sell his eclectic collection in the Morningthorpe Manor House Sale. Both organisations felt they need to act quickly in order to make as many of the lots freely accessible to the public as possible. It was clear that NORAH should be at the centre of any fundraising appeal. It gave NORAH the opportunity to start meeting its charitable objectives and to announce itself to the world. This was despite the fact it was still being set up; the bank only confirming the creation of an account the day before the appeal began. NORAH, taking advice from the NRO, had to make a considered decision on how much it wanted to raise. They decided that £30,000 would enable the NRO to purchase a significant number of the 190 lots which were of interest. The NRO had already secured a grant of £5,000 from Friends of the National Libraries. Using the NRO’s existing channels of communication NORAH and the NRO described the urgent nature of the appeal and summarised the different places and families mentioned in the lots in which NORAH and NRO had an interest. People responded to the appeal almost immediately on Twitter and Facebook. Similarly, individuals and organisations were donating within minutes and continued to do so until the auction started. NORAH reached its target of £30,000 as the bidding started. The NRO purchased almost 90 lots over the four days of the auction. 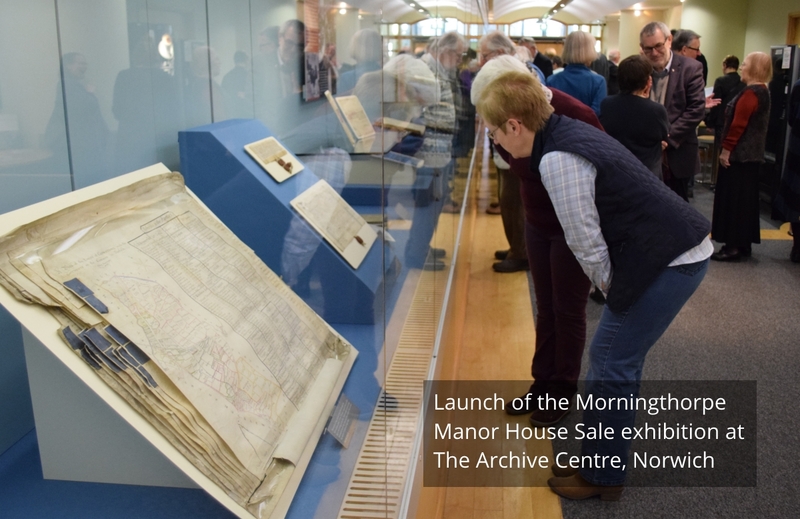 Some of the highlights included a manorial map of 1735, a manor court book for Wells-next-the-Sea, a saddler’s ledger for 1908-1912, an album of photographs by Walter Clutterbuck of 1919 and a seventeenth century patent book of the Dean and Chapter of Norwich Cathedral. Click here for a full list of the documents purchased, the vast majority of which are available at the NRO, whilst a few of the lots were given to the Norfolk Heritage Centre. NORAH wanted to thank everyone who had contributed to the appeal. It hosted showcase events at the NRO so people could have a close-up look at the documents purchased. In early 2017, the NRO hosted an exhibition of many of the documents purchased at The Archive Centre in Norwich. The exhibition guide is available here (please note the document is 85 MB and may take a little while to download). All of the documents purchased are now freely available at either the NRO or the Norfolk Heritage Centre.